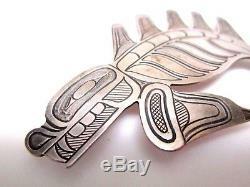 Sterling Silver Handmade American Indian Monster Pin SIGNED. 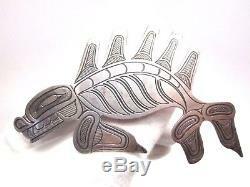 This handmade pin is a sterling silver American Indian pin depicting a monster! 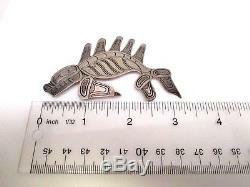 This monster pin has great detail, and is hand engraved. 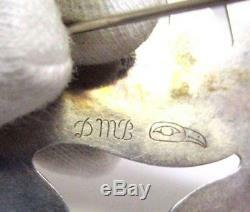 The back is signed with the initials DMB with makers mark of an eagle or bird head. 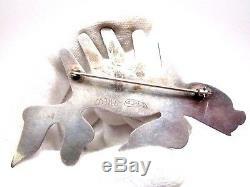 This is a nice heavy big pin! 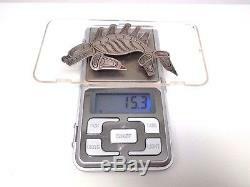 The pin measures approximately 3 1/4 inches, and weighs 15.3 grams. John and Myers, Lexington KY. We are open Tuesday - Friday 11:00pm to 5:00pm. 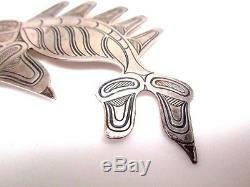 All products are examined and researched to ensure that you, the customer, are getting 100% Authentic pieces. If you have any questions or need any additional information, it would be my pleasure to help you. We're here to help with any questions you may have.